The 1993 to 1997 eurovans do not have transponders (immobilizers) here in the usa, however some european market vans from Canada may have the immo system. If it does not start the van, you now have a hide-a-key and if the key that starts the van is lost, you can make new keys from that key. for 1993 to 2003 models without a chip. Use it to get your chip key copy cut. 2 button remote modified for 1998 to 2003 Eurovan $65. Does not have a red panic button on the side. Activation of the chip is needed at your local VW dealer or qualified automotive locksmith, you program the Van not the key. Have your key copy-cut at your local hardware store or locksmith. I do not cut them. 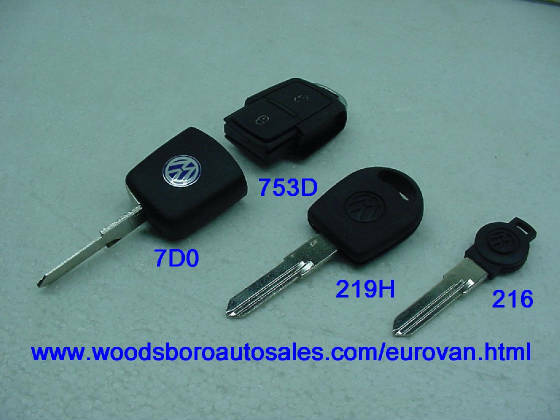 Eurovan flip key with 2 button remote 2001 to 2003. (Not for Rialta or vans with 2 button non flip key). Put a key in the ignition and turn it on then off within 5 seconds Within 15 seconds turn the ignition back on and lock the drivers door by pushing the button down manually from the inside (you are sitting in the van with the door closed) Press the door unlock button on the remote two times within 30 seconds The remote is now matched to the van. Turn the ignition off. If you want multiple items, please email and a paypal invoice will be sent, thanks.